This is a bibliography of U.S. congressional memoirs by former and current U.S. Senators. The United States Senate is the upper house of the bicameral legislature of the United States, and together with the United States House of Representatives comprises the United States Congress. 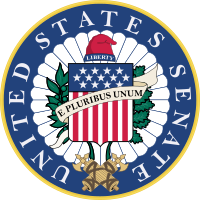 The composition and powers of the Senate are established in Article One of the U.S. Constitution. Each U.S. state is represented by two senators, regardless of population. Senators serve staggered six-year terms. The chamber of the United States Senate is located in the north wing of the Capitol, in Washington, D.C., the national capital. The House of Representatives convenes in the south wing of the same building. Danforth, John C. (2006). Faith and Politics: How the "Moral Values" Debate Divides America and How to Move Forward Together. New York: Viking Books. ISBN 978-0-670-03787-2. ^ a b c d e f g h i j k l m n o p q r s t u v w x y z aa ab ac ad ae af ag ah ai aj ak al am an ao ap aq ar as at au av aw ax ay az ba bb bc bd be bf bg bh bi bj bk bl bm bn bo bp bq br bs bt bu bv bw bx by bz ca cb cc cd ce cf cg ch ci cj ck cl cm cn co cp cq cr cs ct cu cv cw cx cy cz da db Dorothy Hazelrigg (ed.). "Bibliography of Congressional Memoirs-U.S. Senators" (PDF). University of South Carolina. Retrieved 2011-11-28. ^ "Constitution of the United States". Senate.gov. 2009-03-26. Retrieved 2010-10-04. ^ United States Congress. "KENNEDY, Edward Moore (Ted), (1932 - 2009) (id: K000105)". Biographical Directory of the United States Congress. Retrieved November 26, 2012. ^ "LODGE, Henry Cabot, (1850 - 1924)". Biographical Directory of the U.S. Congress. Retrieved 2011-12-03. ^ "McKELLAR, Kenneth Douglas, (1869 - 1957)". Biographical Directory of the U.S. Congress. Retrieved 2011-12-03. ^ "MACLAY, William, (1737 - 1804)". Biographical Directory of the U.S. Congress. Retrieved 2011-12-03. ^ "MANGUM, Willie Person, (1792 - 1861)". Biographical Directory of the U.S. Congress. Retrieved 2012-12-03. ^ "MITCHELL, George John, (1933 - )". Biographical Directory of the U.S. Congress. Retrieved 2011-12-01. ^ "SCOTT, Hugh Doggett, Jr., (1900 - 1994)". Biographical Directory of the U.S. Congress. Retrieved 2011-12-01. ^ "SHERMAN, John, (1823 - 1900)". Biographical Directory of the U.S. Congress. Retrieved 2011-12-01. ^ "SMITH, Margaret Chase, (1897 - 1995)". Biographical Directory of the U.S. Congress. Retrieved 2011-12-01. ^ "STEWART, William Morris, (1827 - 1909)". Biographical Directory of the U.S Congress. Retrieved 2011-12-01. ^ "TRACY, Uriah, (1755 - 1807)". Biographical Directory of the United States Congress. Retrieved 2011-11-30. ^ "UNDERWOOD, Oscar Wilder, (1862 - 1929)". Biographical Directory of the United States Congress. Retrieved 2011-11-30. ^ "VANDENBERG, Arthur Hendrick, (1884 - 1951)". Biographical Directory of the United States Congress. Retrieved 2011-11-30. This page was last edited on 16 February 2018, at 19:59 (UTC).